Is sponsorship really what you want? This is a short modified extract from this weeks ACA Business Acumen module. 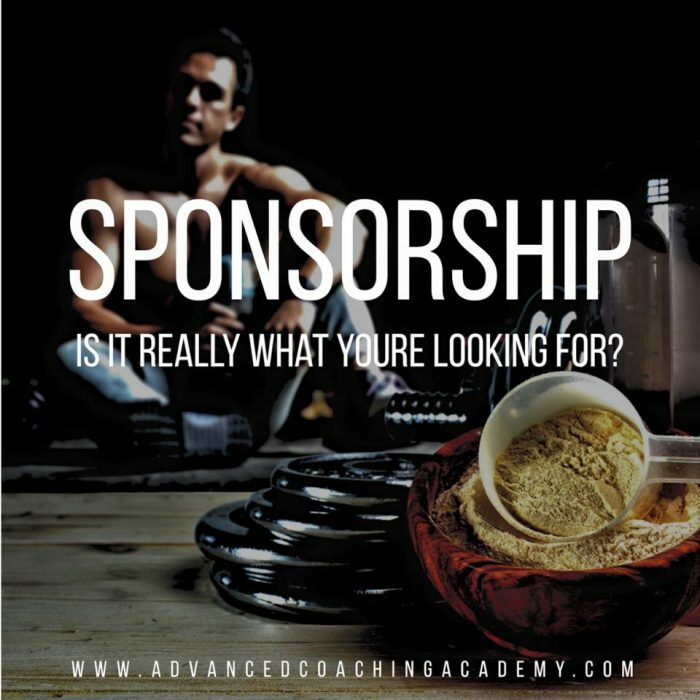 What appears to be one of the things people in the fitness industry relentlessly chase is sponsorship. Maybe they want to be perceived as professional athletes or want the credence of being associated to a brand? I remember as a child wanting the same thing. I wanted boots that matched my shorts that matched my top. I wanted all my cricket gear to match (I actually ended up sponsored at cricket, that will be something many of you wouldn’t have pictured right). But I wanted to belong to something and feel like a professional athlete. Your image, reputation, personality and character all play a role in companies deciding who represents their brand accordingly. ��New startups quite often simply go at numbers, particularly when it comes to social media. They need exposure and will pay base rate to get that exposure. In some cases this may pay off in others it may destroy companies. If the persons image, reputation, personality and character poorly represent the company you can see how that can be detrimental. Companies more often than not sponsor people with products. Lets use a hypothetical supplement sponsorship deal. Numbers will vary a little bit but you can get an idea from this. A sponsorship for £100 RRP of products a month may cost a company around £12-15 a week. They want to tap into your social media audience that has a general interest in their product and one that you, your hard work or your toned booty has created. ��In return they may ask for promotional posts, appearances and the use of your images as part of the ‘sponsorship’. What may amass to 1-2 or more hours a week of your time. That time, using that equation is fundamentally worth £6-£7.50 an hour to you. It also saturates your social media with product orientated posts. Yes, you get the apparent kudos of being associated with a brand but the return on your investment is poor. You also have to remain loyal to that single brand which narrows your choices and creates bias in your service based work. If you’re lucky enough that your audience grows switching then to a larger brand with a more lucrative deal creates dis-trust when one moment ‘X’ has the best supplements and now all of a sudden ‘Y’ produces them. This over time creates distrust and ultimately turns your own audience against you. The same audience that if you played your cards right was the reason you started your social media business page. Be careful why you’re seeking sponsorship and if you do make sure its value to you is what you want.